Almost anything is interesting when you find enough to it, and today, we're looking at the original Northgate McDonald's (and its replacement). Opening in December 1973 at the northeast corner of Spence Street and University Drive built by Philip Springer, the original McDonald's in Northgate was in many ways one of a kind with the only McDonald's in the area until 1977 when the Manor East Mall location was built. 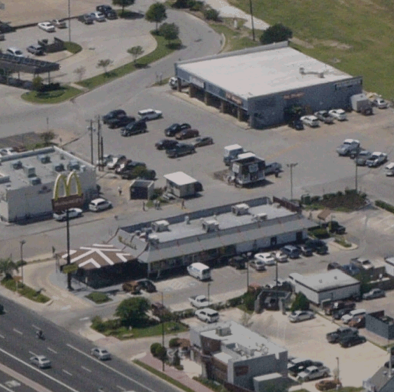 The Northgate location actually won a landscaping award (local only) when it opened when a 1976 article described that the McDonald's cleans up all the trash in and around the area, with "small pines, evergreens and grass [comprising the landscape]". It's a far cry from the island it is today surrounded by concrete. Later on (and I have a bit of a picture to prove this), it added a little curved "solarium" window much like a Wendy's would have. This I remember being demolished and rebuilt in the very early 2000s, though I can't remember if it was rebuilt with the new "front" or not. I think it was. I vaguely remember the little "ATM" flags flying over it (as Wikimapia reports), which were after the rebuilding but before a renovation. I can't tell what that thing is in the pictures post-demo pre-remodel (which happened around 2007, as it points out). Looking from a side-view aerial looks like it's some sort of covered playground area, which must have a post-rebuild touch, but it doesn't matter because it was demolished for an expansion of the eating area (and featuring a study area). Actually, a MyBCS thread reveals it was to be used for live music, which, unsurprisingly, turned out to be a failure, so it just became outdoor seating. #1: This McDonald's did delivery. Yes, I know that a select number of markets did it in the 1980s (featuring a commercial which has unfortunately been removed from YouTube for some reason or another), it's being done in other countries, and they want to do it again (newspaper articles from April 29-30 2013 too numerous to link to). From what I could tell, it was a franchise-specific thing, and of those, only this location. This ad was from 1992. #2: This McDonald's did tours as well. Here's a bit from a "Things for Children to See & Do in the Bryan-College Station" guide from the mid-1970s. This was back when it and the Villa Maria location were the only McDonald's locations in town. They definitely don't do this today anymore. UPDATED EXTENSIVELY IN AUGUST 2014. 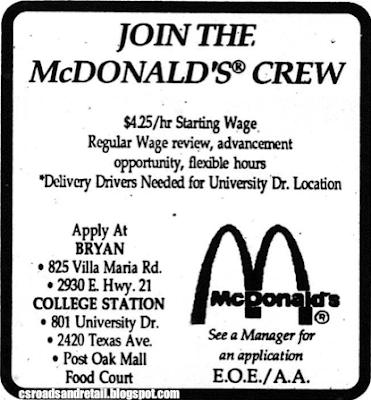 I was in College Station from 94-99 and always thought this was a weird McD's location. When I first moved to CS, there was a weird game room/arcade in the back of the building that couldn't be accessed from the inside--you had to go outside and around back. I remember when they redid it and added the "live music" area in the front--I only remember ever seeing one band play there, right after they reopened. It seems like it was within weeks of opening that they reconfigured it to just be outdoor seating. This McDonald's IS open 24 hours (which isn't uncommon, but the dining room is also open 24h, which is unusual). The proximity to the bars causes dozens of people to crowd in and around it, causing all sorts of problems and requiring on-site security.